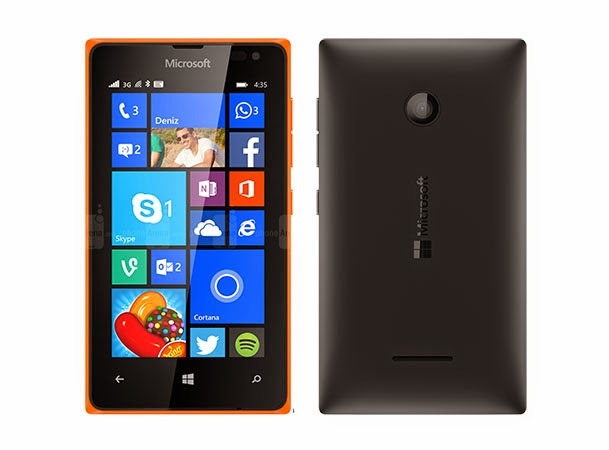 It is most inexpensive Smartphone from the Microsoft with decent features in its price range. Handset is loaded with Snapdragon 200, 1.2 GHz Dual core processor along with 1 GB RAM, 2 MP Primary Camera and 3.5 G Connectivity. The phone is slightly bulky with 12mm thick and weighted 134 grams, body is made up of plastic available in 4 colour variant Black, White, Green and Orange. The back cover and battery is detachable and processor (Qualcomm MSM8210 Snapdragon 200) is not so powerful but phone runs smoothly, high graphical games are either not running or runs in low quality. The screen is decent while it has 480 x 800 resolution with screen density of 233 ppi. The battery capacity is 1560 mAh but gives satisfactory backup (11 hours 45 min Talktime). Its 3.5 G enabled smartphone. Handset is upgradable to Windows 10. Dual Core processor with 1 GB RAM. Display is bright and colourful and it's pleasant. External SD card support upto 128 GB. It is inexpensive budget phone. Doesn’t have Corning Gorilla Glass protection for display. The main camera is only 2 MegaPixel. Battery is only 1560 mAh. This Smartphone made for the people want to own a windows phone with very normal features, yeah its cheapest Lumia phone does not make any load in your pocket. The 2 MP camera is able to capture acceptable quality images even in low light while front vga (0.3 MP) Camera is not so clear. But phone has compact body it run smoothly doesn’t lag and display is sharp. Now Choice is yours.